Step 3: Lay The Foundation - Now that you know which country, how many people, how much you have to spend, and who is responsible for creating your vision, you have to actually create the vision. The first step to building anything real, is to lay the foundation upon which everything else will be built. In the case of a destination wedding, the foundation is the Accommodations. Until you’ve picked the accommodations, no details of the wedding can be determined. If your hotel of choice has grounds for a wedding, great, but sometimes they do not. This topographical fact impacts every other decision that is made. Further, every hotel will have different services and policies pertaining to weddings. Some hotels have a policy that all guests attending the wedding must stay at that hotel, while others limit the size and frequency of weddings at their location, and there are those with great in-house wedding coordinators, while others….not so much. Never fear, though. Much of the decision will narrow down the options, and your experienced destination manager or wedding coordinator can help you take this bite of the elephant with ease. Step 4: The Guests - Elopers, Please Proceed to Step 4, All others, keep reading. Regardless of how you are creating your wedding, someone needs to book and communicate with your guests regarding their trip. For my clients, I create a document (very simple, i’m no stationer) that congratulates the guests on being invited, introduces them to the property they’ll be staying at, outlines the details of their stay including costs, and provides my contact information for questions or in order to book. By this time, I will already have a hold on a block of rooms for your guests, and the process glides along. When considering your guests, you should give thought to a wedding favor and thank you gift for them. I particularly love to custom design and tailor each gift to match the flair of the wedding. Consider their wallet as well. I know you cant go around asking people what their budget is, but you do have a rough idea of a range per night for a hotel room. A good destination planner will be able to guide you to the right 1 or 2 properties that should meet just about anyone’s needs. Step 5: The Details – If you havent completed steps 1 – 4, Step 5 is mental candy, and nothing more. It’s the part that allows us to frolic on the internet, and create wonderfully inspiring pinterest boards. And, by the way, every destination wedding couple should have a pinterest board. There is no better way to share your vision that with visuals, and pinterest helps me to “see” what you are talking about. After you know which hotel you are staying in and the number of guests, we can then you can start adding in all the details. Chairs, tents, flowers, music, catering, fireworks, steel drums, lighting and every other little thing can now, finally, be determined. Every couple does it…they jump waaaaaay ahead to step 5. The truth is, it’s just a dream unless you’ve done steps one through four because you have no idea what any of those embellishments to your wedding will cost until you know where in the destination you are getting married. Transportation costs are a very real consideration in Belize, as fuel is $6 usd a gallon, the cost of various flowers is greatly dependent on the time of year and region of the country, and so on. Also, it’s nice to plan a couple group activities, or “tour days”. While people can do whatever they like, it’s been my experience that once one part of the group wants to go do “x”, others say “me too!”. Providing a rough, flexible itinerary for the week helps your guests begin to prioritize their own vacation, while taking your wedding events into consideration. 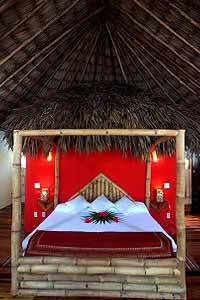 Belize Destination Wedding expert Lara Goldman from Romantic Travel Belize answers your questions, doles out useful advice and shares her opinion about... well, everything! Lara's unique perspective is a breath of fresh air and exactly what you're looking for whether just for advice or for full service event planning. Click here for the list of Lara's columns.